Ideas are born through sparks of inspiration and from a certain something inside of us that urges the desire to create. The many shapes and forms of creativity are infinite, thus it is present in everything we do and inevitably these moments of inspiration become a motivation for another idea, a re­evolving creative journey​. This particular journey began in 1943 with the death of the poet Paul Celan’s Father, upon receiving the tragic news Celan was inspired to write a poem entitled ​Black Flakes​. 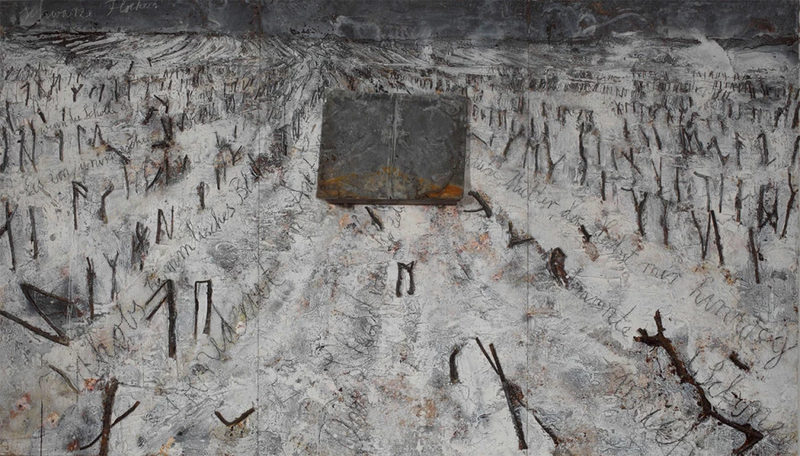 Some 60 years later (2003) artist Anselm Kiefer was so struck by the poem that he created his own incarnation of ​Black Flakes​. ​The death of a poet’s Father​channels the inspiration of both artists in an attempt to progress and evolve the emotional and reflective depth that has already been conceived. The compositional itself develops ideas formed in the Musique Concréte movement and Abstract Expressionist art as well as drone and feedback techniques heard in contemporary noise music. The sounds that you hear are derived from my own field recordings made up purely of the materials used by both Kiefer and Celan.